All of these companies redefined their respective industries because they focused on delivering the best possible customer experience. What set these companies apart and made them the no-doubt choice for the majority of consumers is that they leveraged technology effectively to solve a problem with the way a given service was being delivered. Netflix delivered convenience and freed customers from late fees. Uber reduced the uncertainty of cab travel and minimized the opportunity for fraud (recently covered in my own hometown Toronto). Amazon offered a high-end customer experience and personalized service. Airbnb freed travelers from limited availability and pricing options. Apple unbundled music content and allowed consumers to purchase specifically what they wanted (songs) rather than forced packages (albums). Their technology, in isolation, would have helped them to compete in these spaces, but what’s truly differentiating, redefining and impactful is their reimagination of the delivery of their respective products/services around the needs of the consumers rather than the needs of the producers. Higher education is in the midst of a similar tidal wave now, but for the most part, we’re still chalking up the shifts to newly available technologies rather than the sea change toward meeting customer expectations. To put it simply, colleges need to become student-centric to succeed in the future. What Does Customer Service Look Like in Higher Ed? To start, this requires institutions across the board to start thinking seriously about who their customers are and what they’re looking for from their institution. Technology is obviously important to delivering the kind of customer experience the modern student expects, be they an 18-year-old coming straight from high school, a K-12 learner in a summer camp, or an adult. At a starting point, delivering a great customer experience involves recognizing that student expectations are defined by what they see in the eCommerce industry, and trying to mirror those best practices. Those technologies on their own won’t make a significant difference, though, unless they’re leveraged as part of a broader strategy to deliver a student-centric, customer-focused experience to learners. 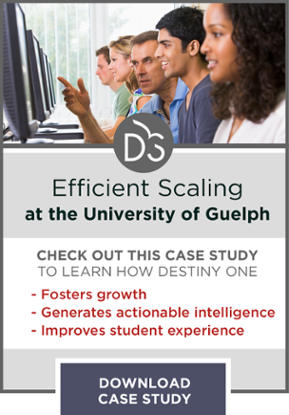 For Michelle Fach, Director of Open Learning and Educational Support at the University of Guelph, investing in a new back-end system helped her division to accomplish the realization of the customer service vision they’d set out. “There are a few key characteristics that define a great customer experience for postsecondary students, and chief among them are approachability of staff and the system,” she said in an interview on The EvoLLLution. “We need to create an environment where students don’t have to go to multiple spots to get one piece of information—or to get different information on the same question from multiple sources. Of course, as Fach alludes to above, this means not just focusing on products that face students directly, but also on the processes that guide staff work. After all, Amazon doesn’t exist as a front-facing website that relies on numerous staff touchpoints to look automated. They back up a great front-end experience with a back-end infrastructure designed to deliver automation and personalization at scale. As every other industry evolves, higher education leaders cannot assume their space will remain unchanged: sleepy, ivy-covered, and defined by what’s right for the institution. Customers are being placed at the center of every other industry and they will expect for their needs to be prioritized by the institution as well. (If that sentence annoys you, please read this prior article defining the limits of “customer service” in higher education). 1. Netflix delivered convenience and freed customers from late fees. Provide students with more access to flexible program modalities and scheduling. 2. Uber reduced the uncertainty of cab travel and minimized the opportunity for fraud. Deliver a secure environment where students can pay by credit card and be confident in the safety of their data. 3. Amazon offered a high-end customer experience and personalized service. Understand that your students are customers and build infrastructure and culture to match that reality. 4. Airbnb freed travelers from limited availability and pricing options. Become more flexible with programming types and create a wider array of credentials that can be offered at numerous price points. 5. Apple unbundled music content and allowed consumers to purchase specifically what they wanted (songs) rather than forced packages (albums). Unbundle programming to deliver more diverse programming across the entire Spectrum of Access. Easy right? Well, no. But necessary. To learn more about how the University of Guelph OpenEd leveraged Customer Lifecycle Management software to deliver on their vision of a customer-centric education environment, please click here.